Amazon.com #1 Best Selling Author John Cote explains how getting your clients to review you online is critical for 2013. The reputation economy is here and anyone with a smart phone can make an instant decision to buy from you or not based on a review they find online in seconds. Now Where Are My Sales? 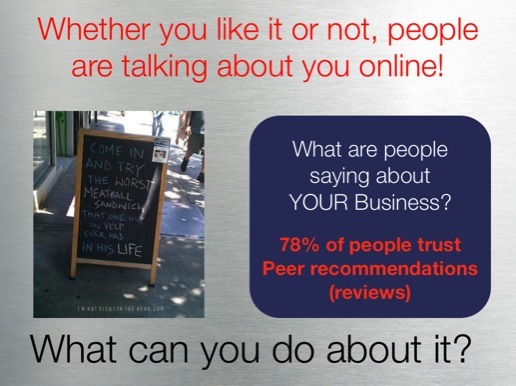 Now that more and more people do online research before they buy, your online ratings are more important than ever. You can't afford to have low ratings - and you can't afford having no ratings at all. If you want your business to thrive online, you need to start seriously thinking about maintaining and improving your online reputation. One of the most effective ways to do this is to have a lot of legitimate, online 5-star reviews for your business - and we can help you with that. Here at Rocket Social Marketing, we've developed a tested system that helps you get more 5-star reviews on sites like Google, Yahoo, Bing, Yelp, CitySearch, Trip Advisor and more. Say goodbye to obscurity and say hello to being the number one brand in your area that your target customers will trust. #1 - Better visibility in search engines. When potential customers search for your products or services via Google, Bing, or Yahoo, the first results that usually come up are the businesses with the highest customer ratings. Let us say that again: it's the businesses with the highest customer ratings that typically show up higher in search results. And, if you show up first, potential customers are more likely to check your business first before they check the rest of the businesses on the page, especially if your competitors have no reviews and ratings as your listing will stand out with the 5 yellow stars. By using our system for generating more 5-star reviews, you can achieve this. This can help you get an advantage over your more established competitors who won't have the same amount of high-quality reviews that you have. #2 - Improved credibility for your business. Potential buyers tend to trust companies with a reliable track record - and the way they do this is by checking existing reviews and ratings left by previous customers. Through our system, you can gather high-quality 5-star reviews that can help new customers quickly decide to buy from you rather than your competitors. Leave the competition in the dust while you divert new, incoming customers to your business. Your business will be a trusted, credible brand in no time. #3 - 100% Authentic Reviews. 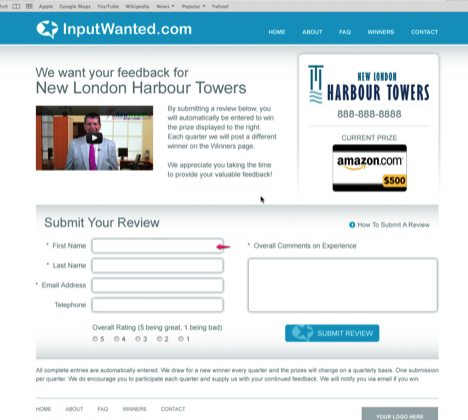 ALL OF YOUR REVIEWS WILL BE SUBMITTED BY YOUR ACTUAL CUSTOMERS! We have the tools to make it easier for them to leave positive feedback. You don't have to worry about search engines flagging your business as a scam. When these search engines dig deeper, they'll know that your customers are sincere about the high ratings they give you. You'll receive reviews and 5-star ratings that are 100% genuine and legitimate. #4 - Done For You Marketing! Our system automates the process and allows you to focus on working ON your business instead of IN your business. Let's face it, business owners are busy and so are their employees. Few businesses take the time to implement this type of system because it can take a lot of time and effort. Let us handle the details for you. Once your client provides the feedback is when the magic happens. All the 5-star reviewers will automatically receive an email instructing them to leave another copy of their 5-star review on Google, Yahoo, Bing, Angies List, etc. We will monitor which search engine or review website you should be focusing on and we will adjust the back end automatically. You want to have great reviews on all of the review websites. As a result of posting the review on the final review website, they'll receive 3 more entries for this quarter’s prize. On the other hand, those who submit a 4-star review or lower will be sent a simple "Thank You" email, not bringing them to the final review website. Because you are carbon copied on every review submitted, you can opt to reply to them individually to address any concerns they may have - but they won't be invited to leave reviews for Google, Yahoo, Bing, Angies List, etc. Additionally, as an added bonus, we will submit to you a quarterly report with ALL of the reviews submitted so you can work with your team to continue to improve your customer service which will certainly lead to more referrals and sales. In short, the automatic triaging process will help ensure only the 5-star reviewers will get reminders to republish their 5-star reviews on public sites. This way, your best reviews will get the limelight and bring your business the credibility and visibility it deserves. Let us take care of your online reputation for you. Our system may sound complicated, but there's no need to worry. We'll take care of the process for you every step of the way. If you're worried about the cost of the prize, don't worry. You don't need to spend any amount of money on the prizes, as we take care of the prizes for you. Instead of every business have to invest $2,000 a year in prizes, we came up with a way to pool the resources, and still have your business announce a winner on your own branded, review website with your logo on it. Now, you may be wondering, "Can't I just write my own reviews?" 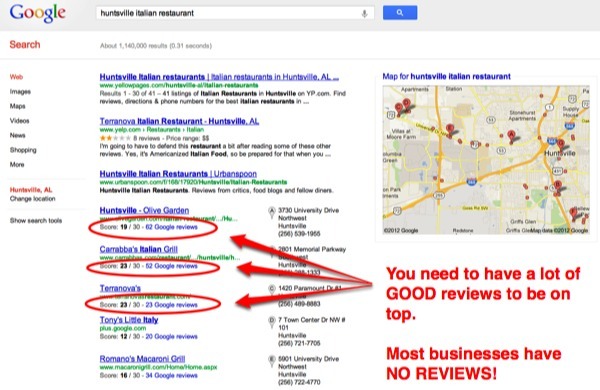 While you certainly could do that, search engines can easily identify if reviews are coming from the same computer. Also, Google can look into your review history to see if you've left reviews before and if your reviews can be trusted. They are very good at sniffing out fake reviews so don't do it! As you can see, it's very short-sighted to try tricking these sophisticated websites into giving you better ratings. But, through our trained staff, our advanced tools, and the tested review-gathering system we've developed, you can get more 5-star reviews legitimately - in only a matter of weeks. Also, we give you the email templates to email your clients each quarter, asking them for their feedback. This strategy helped take one of our clients from 2 reviews with a 1 star rating to 44 reviews and a 5 star rating in less than 48 hours. Let us take care of the grunt work, while you spend your time on the more important things, such as running your business and enjoying your additional profits. Do you want your business to gain a solid online reputation through 5-star ratings? What would it mean to your business if it can instantly gain the trust of incoming customers? Contact us now at 256-585-6780 and we'll take care of it for you. You will receive reviews in your inline profiles and good things will happen to your business!